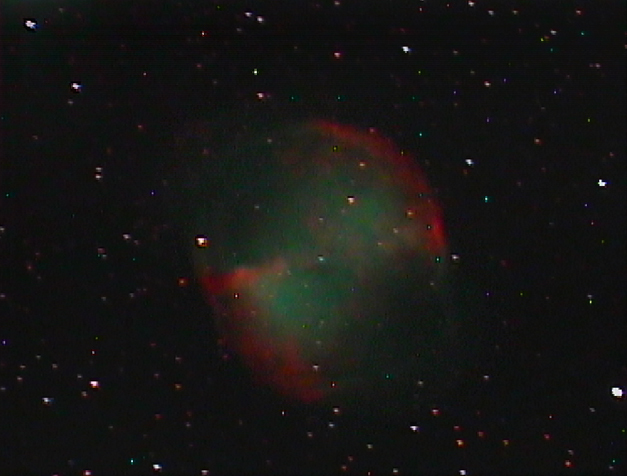 Mike Lancaster produced this image of the Dumbell Nebula on the 26th September 2014. It is a single 90 second exposure taken with a Mallincam Xtreme X2 colour camera at AGC 3 through a 10" Meade LX200 ACF SCT on an NEQ6 PRO mount using an MFR-5 focal reducer and Astronomik CLS CCD filter. The image was un-guided. Image capture was using Miloslick Mallincam Control software. Some processing was performed in Nebulosity v3.2. Additional processing was performed in Photoshop Elements using Gradient Xterminator and Astronomy Tools. 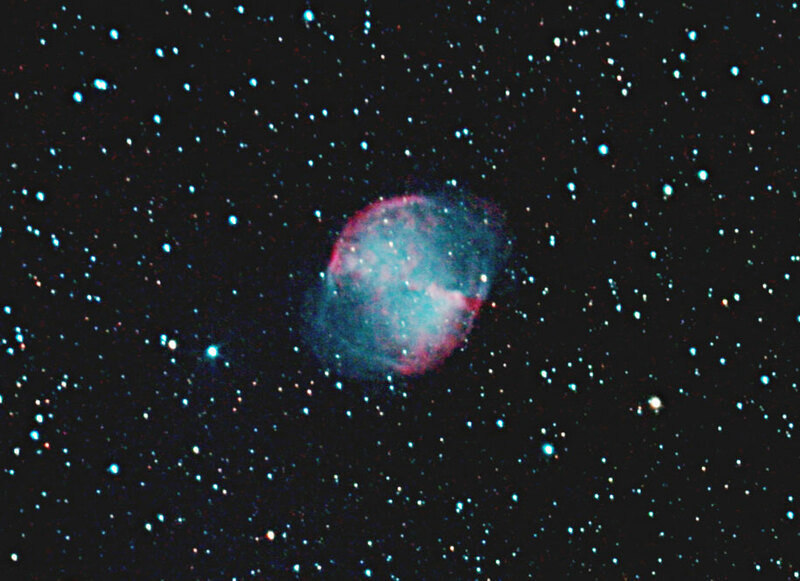 Chris Newsome and Adrian Brown imaged M27 on the 29th July 2007 using Chris' Celestron C8-NGT with Adrian's ATIK-16HR camera. This setup was guided with a Meade DSI camera through a Skywatcher 80T using MaximDL. The image is comprised of ten 90 second exposures (binned 2x2) in H-alpha and ten 90 second exposures (binned 2x2) in O-III. The images were combined in MaximDL and then processed in CS2. The H-alpha was assigned the red channel, the O-III assigned the blue channel and a synthetic green channel was created to produce the RGB image below. The image made Picture of the Week on the BAA website in August 2007. 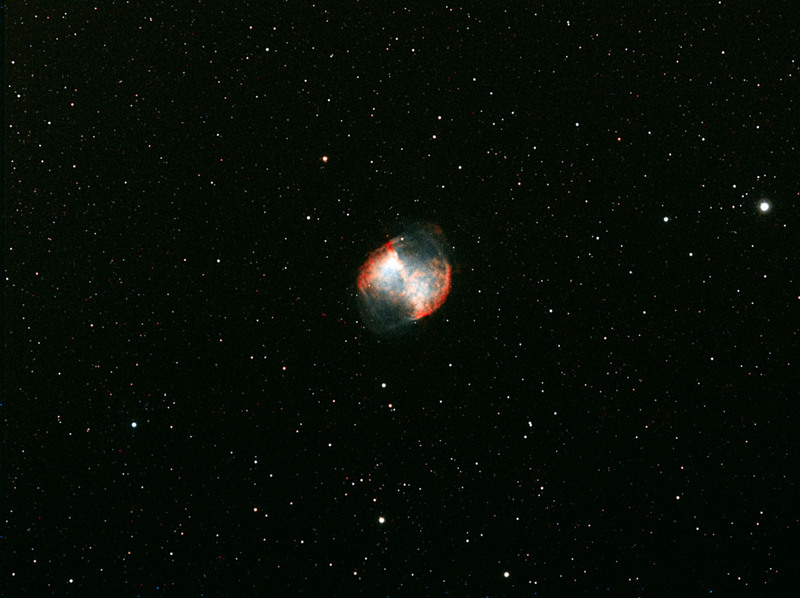 This image of M27 was captured by Adrian Brown on the 12th July 2007. 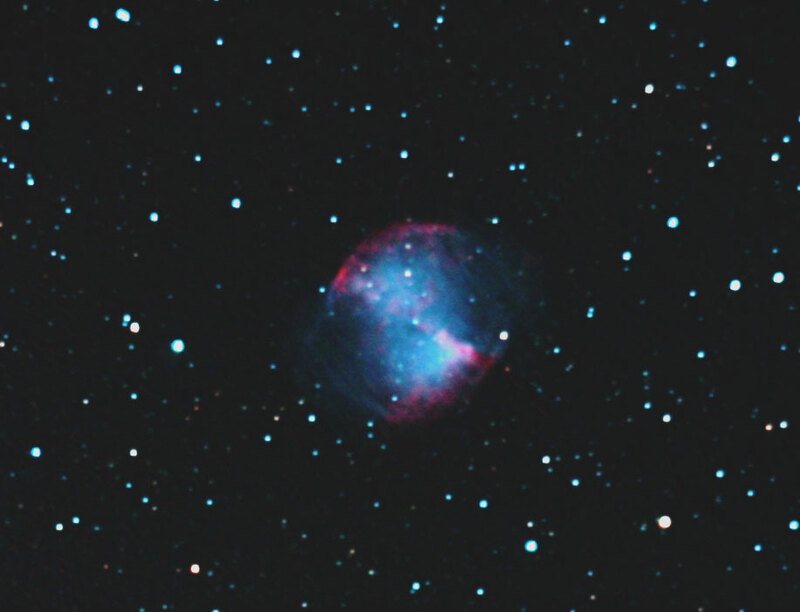 He took 2 five minute images of M27, one in H-alpha and one in OIII, through his Orion 80ED refractor using an ATIK camera (guided by another ATIK camera on a Skywatcher 80T) on a Celestron CGE mount. Total exposure time - just 10 minutes at the scope. The raw images were then processed by Chris Newsome following Adrian's instructions. The H-alpha frame was assigned to a red colour and the OIII to blue in CS2. A synthetic green colour was created from this combination image to produce the final colour image. This was very slightly sharpened and then a slight Gaussian blur was added. Total processing - 10 minutes on the computer. 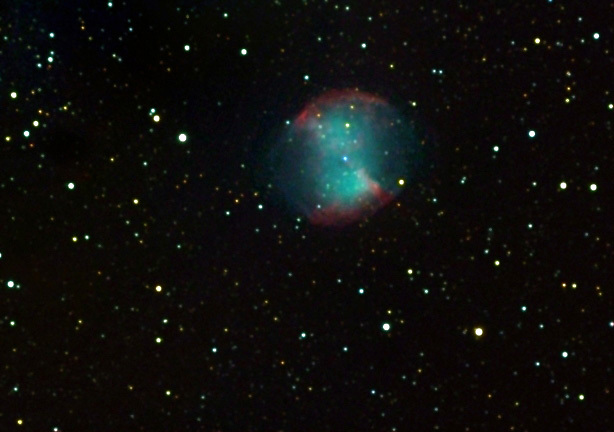 Chris Newsome took the following image of The Dumbell Nebula on the 19th July 2006. He used a Celestron C8-NGT telescope with a Canon EOS 300D camera. This setup was guided by a Meade DSI camera and Skywatcher 80T telescope using a GPUSB interface and controlled with MaximDL. Twenty 4 minute exposures at 200 ASA were calibrated and combined in MaximDL and processed in CS2. 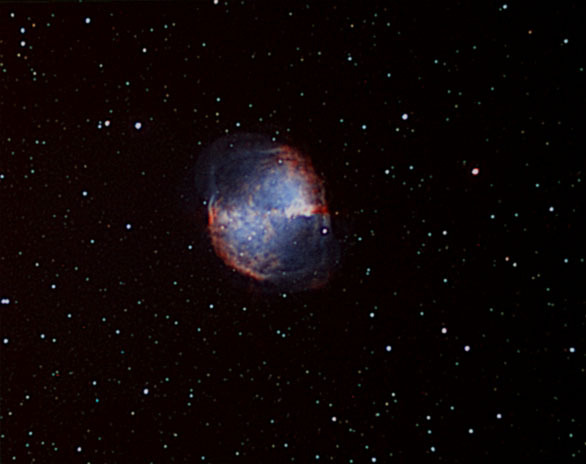 The following image of M27 was taken by Chris Newsome on the 2nd June 2006. He used a Canon EOS300D camera through a Celestron C8-NGT telescope using a CLS filter. This set up was autoguided with a Meade DSI through a Skywatcher 80T refractor using MaximDL. The image is composed of fifteen 180 second exposures at 400 ASA, which were calibrated in MaximDL and then processed in CS2. 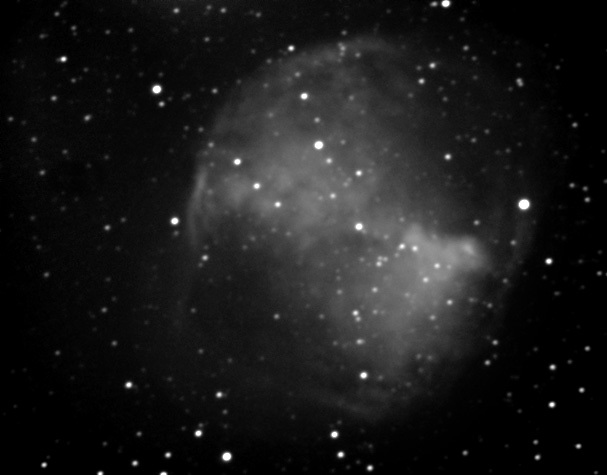 Adrian Brown took the following Image of the Dumbell Nebula (M27) in Vulpecula on the 11th June 2005 using his new 80mm Skywatcher 80ED refractor. This has a focal length of 600mm. He used a monochrome ATK-2HS camera and some Astronomik RGB filters to create the colour image. The exposure details are 16 minutes Luminance (Clear Filter), 8 minutes Red, 8 minutes Green and 12 minutes Blue. Maxim DL 4.11 and Photoshop 7 were used to combine the luminance and colour frames into a single image. This image made Picture Of The Week on the British Astronomical Association (BAA) website on the 18th July 2005. Adrian Brown took the following image of the Dumbell Nebula M27 in Vulpecula on 28th May 2005. The image was taken with a C11 SCT at F6.3 and an ATK-2HS camera. K3CCDTools was used to capture and stack the 39 individual frames that were taken, each of 50 seconds exposure. Maxim DL 4.10 and Photoshop 7 were used to process the image and remove light pollution gradients. Adrian comments: 'M27 was really low down in the sky and the final stacked image was very faint. It took quite a bit of tweaking of the image’s histogram to brighten up the nebula'.